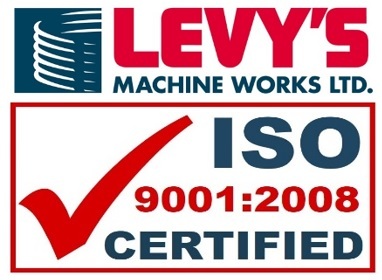 ﻿ Levy’s Receives International Quality Standard Certification | Levy’s Machine Works Ltd.
As part of an ongoing commitment to quality and the continual improvement of its service to its customers Levy’s Machine Works Ltd. is pleased to announce that it has successfully met all the criteria for registration to the international standard ISO9001:2008. Moreover, successful completion of the implementation process and both Stage 1 and Stage 2 certification audits was completed months ahead of the original schedule with only positive observations and zero non-conformances or noted opportunities for improvement. This is testament to the already robust quality management system in place at Levy’s as well as the efforts of all employees at the company who have made customer requirements an absolute priority in terms of quality and delivery over the past few decades. This milestone in Levy’s successful 35 year history will ensure the continued focus on internal performance, overall quality and customer satisfaction, and is key to providing customers with a precision machining and manufacturing service that is second to none for many years to come.